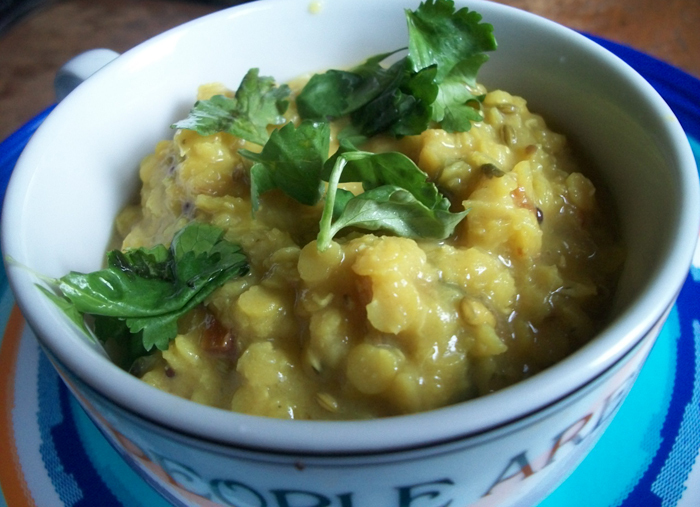 Masoor dal (lentils) are great for someone new to cooking Indian food. Unlike other lentils, they require no soaking and cook in 30-40 minutes. These legumes are orange but change to yellow after cooking. Serve it hot with rice. Recipe is below. If you enjoy this recipe, check out other Indian recipes that go well with dal here . In one pot add in masoor dal and water. The ratio is about 2.5 to 1. Turn on to medium. In a pan add some oil and toss in panch poran, ginger and chillies if desired and cook for 2 minutes. Next add in your onions and cook until translucent. Put contents of pan into pot along with tomatoes, handful of cilantro and seasonings above. Cover with a lid. Cook on medium for around 30 minutes. Check it towards the end and adjust seasoning as necessary. If it needs more sourness add more lemon, lime or amchur. For more creaminess, add a bit of butter or substitute.